It's an occasional but regular sighting in Istanbul. Out of the mist on the Bosphorus that divides Europe and Asia looms the hulk of a Russian warship purposefully making its way to the Mediterranean. Most likely the ship is part of Moscow's so-called "Syria Express", a key supply line for naval deliveries from its Black Sea ports to military operations backing the regime of President Bashar al-Assad in Syria. Dozens of Russian warships, auxiliary naval cargo ships and sometimes even submarines have passed through the Bosphorus Strait, northbound and southbound. Every month since Russia stepped up operations inside Syria last year, according to maritime experts. But the sight of a Russian warship in Istanbul is striking given that Moscow and Ankara are experiencing their worst relations since the end of the Cold War after the shooting down of a Russian warplane by Turkish jets on the Syrian border on November 24. The two countries back opposing sides in Syria's almost five-year civil war, with Russia the key supporter of the Damascus regime while Turkey argues that the ouster of Assad is essential to solving the Syrian crisis. Analysts say that Turkey is bound by the 1936 Montreux Convention on the Dardanelles and Bosphorus, a treaty that gives Ankara full control over the two Straits while committing it to allowing the free passage of naval traffic from Black Sea littoral states. Under its terms, Turkey can only block Russian naval shipping if war is declared or if it feels under an imminent threat of war. 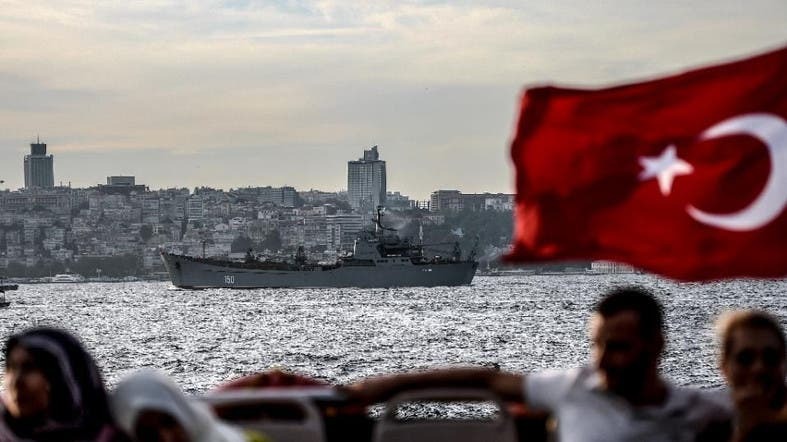 "Since there is no declared war between these two countries it is not possible for Turkey to close the Straits to Russian warships," said Cem Devrim Yaylali, Istanbul-based Turkish naval expert and editor of the Bosphorus Naval News website. He said that even "in the worst days of the Cold War" -- pitting NATO member Turkey against the Soviet Union -- Ankara and Moscow both observed the treaty. Mikhail Voitenko, Russian maritime expert and editor of the Maritime Bulletin website, said that the supplies delivered via the Bosphorus were a "lifeline" for the Syria campaign. "Without the Syrian Express, the Syrian campaign would choke in days or weeks." The ships come from Russia's Black Sea naval port or its Sevastapol base in Crimea, the Ukrainian peninsula annexed by Moscow in 2014 in a move opposed by much of the international community including Turkey. After entering the Black Sea mouth of the Bosphorus, they sail through the iconic waterway in full view, passing famous landmarks like the Ottoman-era Dolmabahce and Topkapi Palaces. They then sail across the Sea of Marmara before passing through the Dardanelles and turning south towards the Mediterranean coast of Syria and Russia's naval base at Tartus, its only such facility outside the ex-USSR. Their passage, however, has not been without tensions in recent weeks. Turkey accused Russia of "provocation" when a soldier aboard the Tsezar Kunikov was spotted on December 4 with a MANPAD shoulder launched missile aimed at the shore. The Kilo-class Russian submarine Rostov na-Donu was also followed by a Turkish patrol vessel during its passage through the Bosphorus last month. Almost all the naval traffic in the Bosphorus is Russian. However, the Arleigh Burke class US destroyer USS Ross made a passage in mid-December, possibly in a show of NATO support to Turkey at the peak of the crisis with Moscow. After one of its planes was shot down just on the Syria border, Moscow has discouraged Russians from travelling to Turkey dealing a blow to the tourism industry and also imposed sanctions on selected goods. But it stopped short of using the full potential array of sanctions and analysts say Russia may be mindful that Turkey could still disrupt the transit of materials to Syria. Voitenko said Turkey could "disrupt the Syrian Express to a near fiasco without violating any of the international agreements on Straits shipping regime." He argued that as well as the warships and auxiliary cargo ships, ordinary freighters are also involved and these could be stopped by Turkish authorities under any pretext. "In fact, Turkey may stop the Russian campaign in Syria without a single shot fired...," he added.